These are the 5 founding members of the Open Repair Alliance. 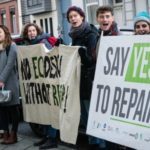 The Germany-based Anstiftung Foundation carries out research into DIY culture and regional sustainability efforts, challenging the common definition of ‘prosperity’ as purely economic and drawing attention to the potential for local projects to improve quality of life on both regional and global levels. As part of their work, they co-ordinate a national network of repair initiatives, involving 700 Repair Cafes across Germany and with a strong focus on repairing in education. The network is planning to increase its focus on data, to capture the true impact of its activities. US-based Fixit Clinic hold pop-up community events where anyone can bring broken items to disassemble. As well as teaching valuable repair skills and helping to prevent unnecessary waste, Fixit Clinic have a strong emphasis on education: they strive to demystify science and technology and teach participants to think more critically about the way we consume and use our products. Their events are founded on the belief that a society where citizens are better informed about the technologies they depend upon is a society that is better equipped to collectively make important policy decision. Started in California, its work has been replicated in Colorado, Minnesota and Massachusetts. They collect data from participants about the faults in the products repaired and the success in repairing them. iFixit is the free repair guide for everything, written by everyone. Anyone can edit or contribute to its enormous online library of over 30,000 free and open source repair manuals, teardowns and troubleshooting documents at iFixit.com, which provides a platform for individuals to share their technical knowledge, empowering and inspiring others to get fixing. Founded on the premise that fixing should not just be possible, but easy, iFixit is a company selling tools and spare parts for repairing. It also has been engaged with legal campaigns across the U.S. to fight for the Right to Repair. 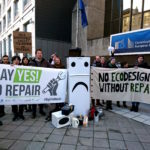 In Europe, iFixit actively contributes to working groups on product standardisation and other initiatives to shape ecodesign policy for future products, and has insights on data gaps which should be filled. The Repair Cafe Foundation began with a community event held by Martine Postma in Amsterdam in 2009. It aims to maintain and spread repair expertise, and to promote social cohesion by bringing together neighbours from all walks of life and sets of motivations in the form of inspiring and accessible meetings. It now provides professional support to more than 1,300 community repair groups worldwide. Anyone can bring anything to a repair cafe: Electrical items, clothing, furniture, crockery or bicycles. The foundation is currently working on a Repair Monitor project, an online tool for collection and sharing of repair data about the events run by the network. The Restart Project is a people-powered platform for change, helping others realise the value of electronics and appliances, and use them for longer. Founded in London in 2012, The Restart Project works not only with communities and school, but with academics, companies, government and like-minded organizations to highlight barriers to repair and longevity, and help drive a global movement to move away from the throwaway economy. 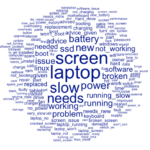 Information about faults and repairs are collected at Restart Parties: free community events for learning electronic repair skills, held in London and beyond. This information is entered into the Fixometer, an online tool for collecting, aggregating and sharing data about successes and challenges with repair.